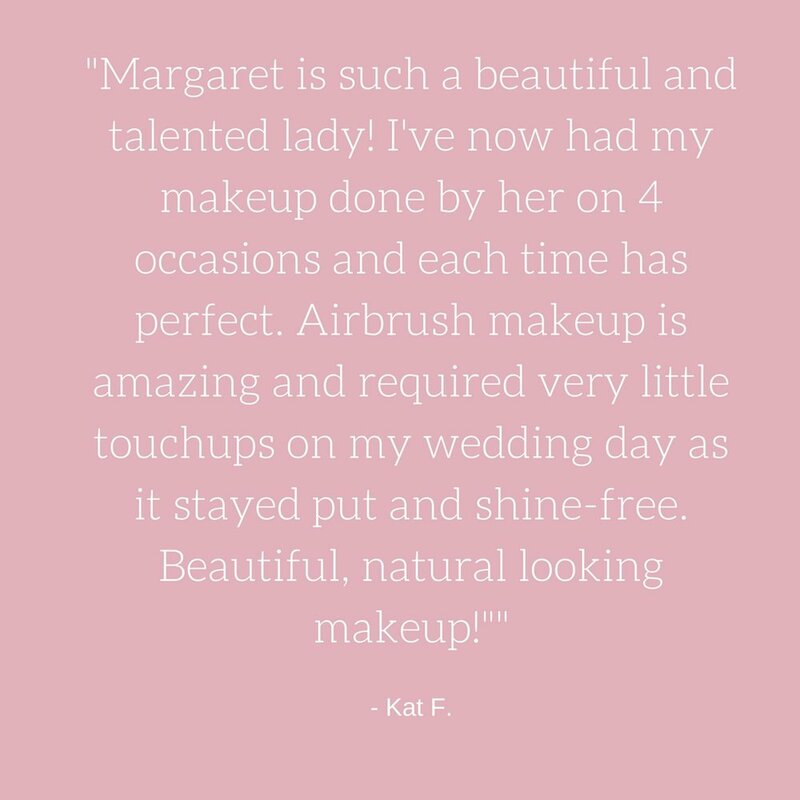 Amazingly talented lady, I have had my make up done twice now by Margaret. Both times the outcome has been outstanding flawless make up that lasts all night even after sleeping in it (because I didn’t want to wash it off I was so in love with it) it was still flawless when I woke up. I cannot thankyou enough for the make up!!!! It stayed right into the evening and the lipstick never wore off!!! Quality stuff!!!! Thank you again for the beautiful work you did for the bridal party, mother of the bride and me on our most unforgettable day. We are forever grateful. You arrived right on the dot at 5am and even though some of the bridesmaids were not ready you waited patiently. You spent sufficient time with each of us and paid clear attention to detail to make it all perfect. I showed you the colour of the bridesmaids dresses and relied on your expertise as to what would suit them best. 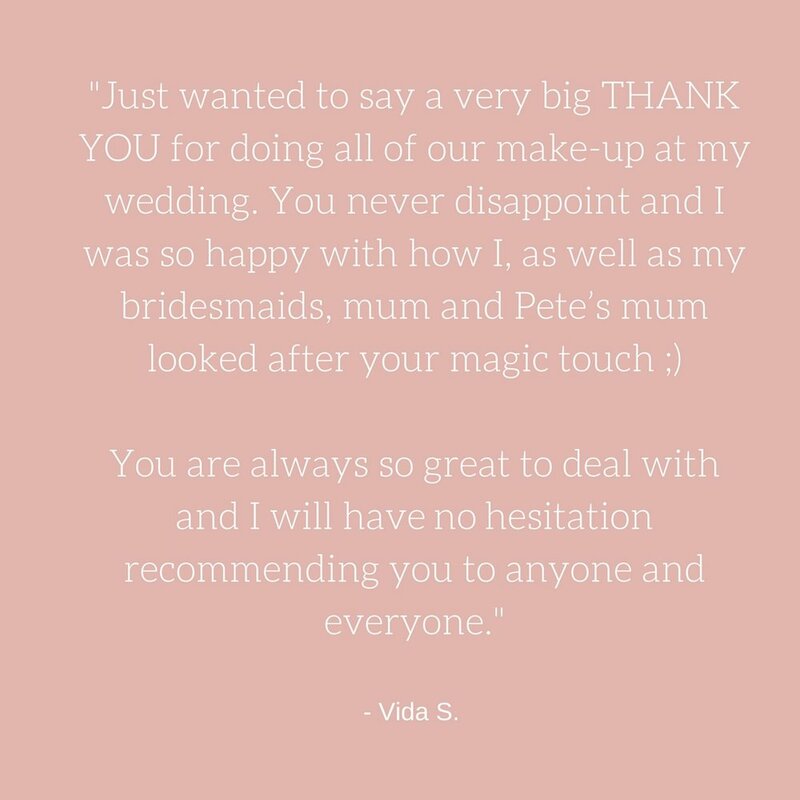 I am glad to have given you that decision as the bridesmaids make up looked immaculate, natural, elegant and definitely made a mark. The bridesmaids looked perfect. My mum was also extremely satisfied with her make up not only did it match her dress but it stayed on all night long and she received plenty of compliments on the day. I felt comfortable with Margaret, it was like catching up with an old mate, laughing about random things. She made the session feel casual, where I could be myself. My trial makeup lasted the whole day, indicating her skills and quality of cosmetics she had used. Her price and overall work gave me the easiest decision with locking her in for my wedding makeup. I received compliments from friends and family with my makeup on the wedding day. If I hear ‘big announcements’ from friends or family, I always recommend Margaret for their makeup contact. Thank you so much Margaret for making me look completely flawless on my special day. 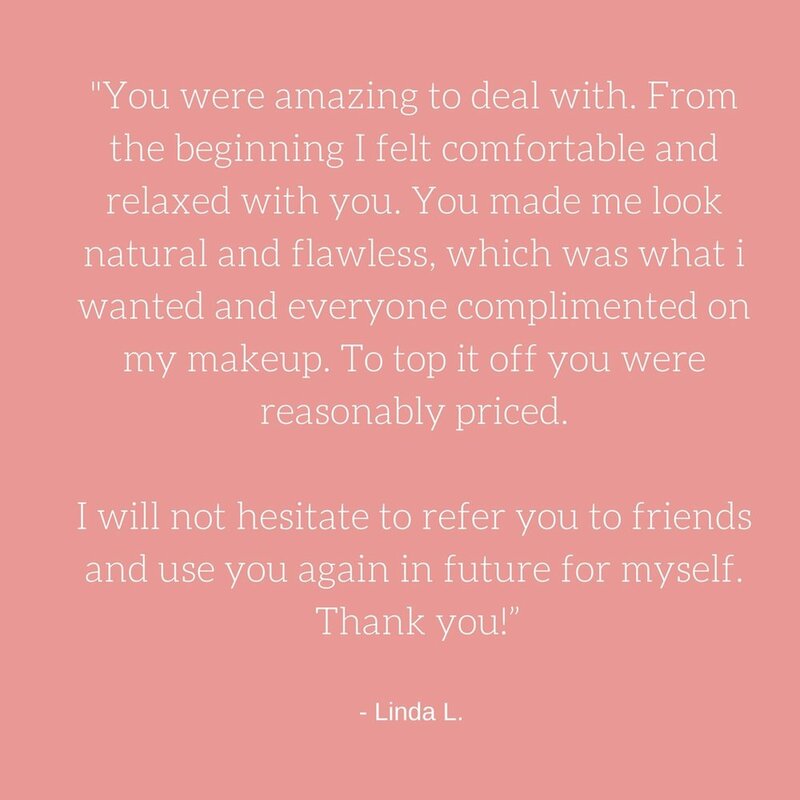 Your cosmetics were incredibly lightweight so it felt like second skin and I loved how it lasted into the night with no touch-ups required! You were exceptionally professional from the moment you arrived and your calm & relaxed nature made you a joy to have. I can’t entirely recall how I met you Margaret, I think it was through my now sister-in-law who recommended you to me for my wedding. I initially thought I’d trial it for my Hens night since it’s quite reasonably priced. What did I have to lose? I hadn’t tried anyone else. What we got was real friendly service. It felt like it was one of the girls doing my make up for the night! And yet still very professional who knew her stuff. Not only did my make up look flawless, I got some beautiful photos of the girls for the hens night shot by Margaret too! And some great products! I think that’s what I was looking forward to the most :) and it was hard to decide what product(s) I wanted at the end of the session! The choice was obvious for my bridal make up. I’m sure I was competing for Margaret to do my bridal make-up since my sister-in-law wanted to book her on the same day too! I went through my engagement party and wedding photos last night and just wanted to say a very late thank you for all the times you have done my make up. Your creativity and ability to enhance my natural features always gives me the confidence I need when I need it the most. Thank you for always being reliable, affordable and most importantly providing such a high quality service. Margaret did a fantastic job at doing mine and my bridal party’s makeup for my beach destination wedding. She replicated the exact look I wanted for my bridal party and I using her own cosmetic range which made us look absolutely flawless and felt great on. Being that it was a beach wedding with the humidity and heat, her make up stayed on perfect. I just wanted to say a MASSIVE THANK YOU for your amazing work you did for my hens night and Wedding day. You truly are an artist. I loved how it lasted all day and night even with all the happy tears shed throughout the day. Your service was outstanding and very affordable. I love how you travelled to us & how relaxed and friendly you were. From initial consultation to actual wedding day, Margaret was professional and friendly throughout. She worked on all 4 of my bridesmaids as well as myself in a timely manner to make us all look great on the day. I could not praise her skills and expertise enough. I’ve since recommended her to all my friends and family for their big occassions such as their own wedding and even baby showers!